‘King John and the Abbot of Canterbury’ is a poetic story(poem that tells story) written by unknown writer before 1695 so it is called Anonymous poem.The two central characters and they are King John and the Abbot of Canterbury.The king is infamous for his wrong deeds whereas Abbot of Canterbury is popular among people due to his popular deeds and behaviors.Once the king of England was quite jealous and suspicious of the prosperity of the Abbot of Canterbury. So he thought that the abbot might make a conspiracy against his throne. The king decided to get rid of him. So he called the abbot and asked three nonsense questions on the condition that he would behead him if he failed to answer the questions within fifteen days. 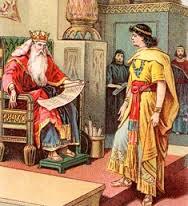 The questions were: What is the exact price/value of the king with his crown of gold on his head among the noblemen? How quickly he may ride the whole world about? What does the king think at the moment? It made him too sad. He tried his best to find the answer by consulting the professors visiting the university but couldn’t. Finally, his own shepherd promised him to help him. So one day, in order to answer the questions raised by the king, the shepherd changed himself as the abbot and went to the palace. One by one he answered that the value of the king was twenty nine pence less than the savior, for the second he responded that it takes a whole day if he rose and ran in the speed of sun that rotates round the earth and for the last, he responded that the king might be thinking that he was the abbot of Canterbury but he was wrong because he was a simple shepherd to abbot.. Finally, the disguised shepherd i.e. the abbot exposed all the truths. The king becomes happy with the shepherd and offers him a place of Abbot in Canterbury. In return the shepherd rejects king’s proposal saying that he is not qualified enough to be appointed as an Abbot. From the moral point of view, the poem is much impressive.An absolute king, under any threat, can take an immoral, unethical, illogical decision to save his throne.Knowledge does not just belong to scholars, and high ranked religious people. Source of knowledge is everywhere and it comes through experience as well.Even an uneducated person sometimes can solve riddles that are unsolved by scholars.Through the poem, the poet proves that the bookish and formal education is not so much effective and useful to solve the practical problems. On the one hand, it has a great lesson that people and their knowledge shouldn’t be judged on the ground of their profession and appearance. Thus the text has taught a great lesson that makes it clear that much is learnt through their daily life activities than from the universities. So the so called ignorant ones in terms of getting formal education aren’t to be ignored and devaluated. The poem seems to be much humorous and satirical. So far it imparts the idea of human knowledge and wisdom, it is appropriate but in whatever way the King Abbot and the Shepherd are presented, they don’t seem believable and convincing. Since the king fails to recognize the shepherd changed as abbot. Similarly, the shepherd is presented in such a way that doesn’t fit him to be more than that it mocks the formal education. It is too difficult to accept it. Can a king ask such nonsense question to a reputed Abbot? Don’t you think Shepherd’s answers are controversial? How can the king leave the person so easily who betrayed him? Reading this poem, I am too much impressed with the fact that only the formal education doesn’t make people capable, rather they may learn many things from the practical experiences too. Having seen in my village, I come to know that many old people are capable of doing various things which other educated men don’t know. So people can learn many things from their practical knowledge and experience.